But no, this is all about "canine motion control," a topic responding to a robotics challenge. The subject of the experiment was not a machine but a real dog equipped with a wearable to take it places, like having its own GPS. Gizmodo's Andrew Lizsewski wrote about the team from Japan who wanted to see what happens with a "wearable vest covered in flashlights that create targeted dots of light to direct a pup's movements." "Canine motion control using on-suit light sources" is the title of the video posted Nov. 2. The video was posted by Tohoku University. 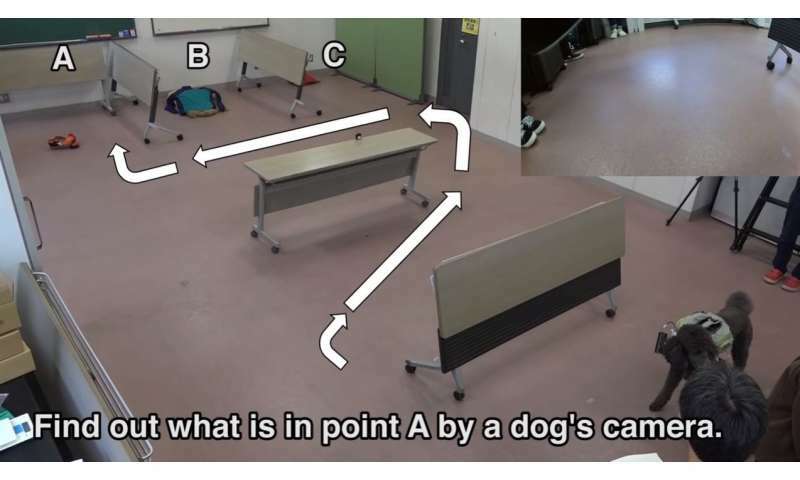 The Japan-based researchers' design is such that an operator can navigate dogs to different goal positions, by changing the direction of spot lights on the dogs' suits. As Popular Mechanics observed, "The dotted lights are just like plot points on a map." Sam Blum in Popular Mechanics spelled out why, beyond being entertained to see a dog prompted to go the right place, their research may have useful results in the real world. The jacket, rigged with several flashlights by researchers from Tohoku University in their experiment, demonstrated "how a highly trained dog might navigate treacherous terrain, using the dots like a human might follow a series of plotted points on a map." Blum had a disaster-relief scenario in mind. Gordon Gottsegen, CNET, made the observation that actually the tech was "surprisingly straightforward." He said that the vest "will shine a light on the ground in front of the dog, and the dog will walk to the left, right or forward depending on where the light points." Jason Daley in Smithsonian.com looked at the researchers' past work. Daley quoted roboticist Kazunori Ohno. He realized that in many disaster scenarios there are people trapped inside but they may be unable to communicate or make their presence known. "In that case, a dog and its ability to sniff out victims is irreplaceable." Ohno has apparently explored the role of the dog and how it can intersect with technology for search and rescue efforts for some time now. The Japan Times in 2016: "Scientists are looking to put a new kind of dog into the fight to rescue survivors of future disasters: a canine strapped into a high-tech vest that will allow it to function somewhat like a robot." The combination of a dog's acute sense of smell and gadgets attached to the animal, could help speed up search-and-rescue operations. Blum fleshed that scenario out: "The vest is equipped with a camera that a human could ostensibly monitor from afar. And since canines are capable of wriggling their way through rubble and other stricken areas better than most humans, this could definitely prove useful for when verbal commands aren't an option."